Built by real estate developer William Van Duzer Lawrence, on Sunset Hill in Lawrence Park, in 1905, this Spanish Colonial/Mission styled hotel was a symbol of exclusivity. With 300 guest rooms, three restaurants, a gracious lobby and grand staircase leading into a ballroom, this hotel represented high style and elegance. After the Depression hit, the hotel started a slow and prolonged decline, until it was torn down in 1972, to make way for townhouses. 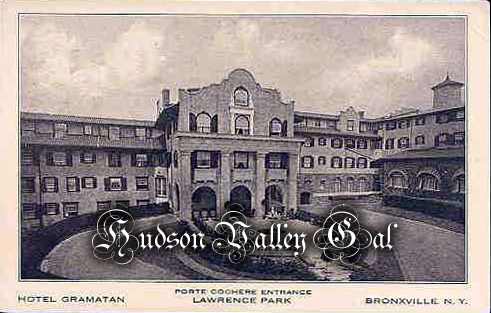 This entry was posted in Bronxville, Hotels, Westchester County and tagged Hotel Gramatan, Lawrence Park, Postcards, Sunset Hill, William Van Duzer Lawrence on May 12, 2014 by hudsonvalleygal. Nestled along the banks of the Hudson River directly across from the United States Military Academy at West Point sits the rural town of Garrison, New York, home to Guinan’s—a legendary Irish drinking hole and country store. While searching for a place to live and a temporary haven following the September 11th attacks, Manhattan journalist Wendy Bounds was delivered to Guinan’s doorstep by a friend. And a visit that began with one beer turned into a life-changing encounter. Captivated by the bar’s charismatic but ailing owner, Bounds uprooted herself and moved to tiny Garrison. There she became one of the rare female regulars at the old pub and was quickly swept up by its motley characters and charms. What follows is a riveting journey as her fate, and that of Guinan’s, unfolds. 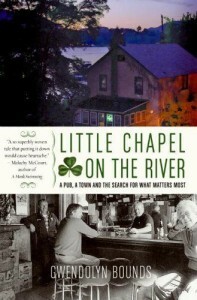 Told with sensitivity, humor and an unflinching eye, Little Chapel on the River is a love story about a place—and the people who bring it to life. Along Bounds’s journey you’ll meet the people of Guinan’s: Jim Guinan himself, the stubborn high priest of this little chapel who spins rich tales of the town’s robber barons, castles and mythological swans that feed at his front door; his grown children, whose duty to their father, and the town, have kept Guinan’s up and running against immeasurable odds; Fitz, a tough-talking Vietnam vet who eventually takes the author under his wing; Tom Endres, who first rowed to the bar illegally as a cadet and who returned as a full-fledged colonel in the U.S Army; Walter, the kindhearted and neurotic next-door neighbor who torches dandelions with his lighter; and Lou-Lou, the overweight doe-eyed hound and the most faithful four-legged parishioner at the pub. This beautifully written, deeply personal and brilliantly insightful book is as much about remembering to value the past as it is about learning to seize the present. Filled with stories of joy and sorrow, of universal family struggles with loyalty, love, betrayal and redemption, this work ultimately brims with hope as Bounds expertly captures a nostalgic slice of quintessential American life. And while chronicling the pub’s fight to endure and her own search for a simpler way of life, she shares how and why the spirit moves those who come to worship in this little chapel on the river. This entry was posted in Books and Publications, Garrison and tagged Gwendolyn Bounds, Little Chapel on the River, William Morrow on May 9, 2014 by hudsonvalleygal.